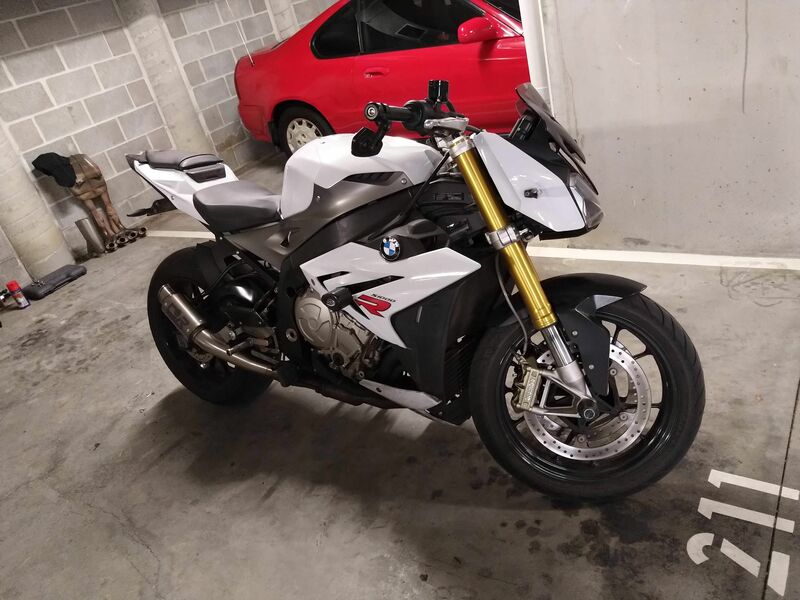 To the ones of you that did this mod, did you end up remapping the bike? Ive ridden mine a few 100km now and to be honest I don't feel any lack of power, but the sound has definitely changed a lot. When suddenly closing the throttle it sounds like a shotgun. The bike is surprisingly less jerky at lower revs, but even though the bike runs smooth, the sound is sometimes changing as if the bike would be very jerky. It sounds mean but I was thinking about having the bike tuned. Just wanted to know if someone else had done something after this mod. I'll see if I can't have a video made and uploaded within a day or two. Got the sound video made. Hi all, yes, I know - this is an ancient thread. I'm gathering parts in order to do this mod. I have the headers (bargain at $170 Australian) and they came to me without the rr bracket that goes behind the sump. I managed to order it new from BMW, shipped to Aus for $90 including GST. That's £50, so not too bad! Part number is 18 51 8 548 855 for anyone who needs it. This week I fitted the RR headers and a Racefit Growler. The slip-on doesn't line up with the R rearset (I have HP rearsets, not sure if that makes any difference) so I just made a short bracket out of Aluminium. Install was a pain in the arse, the bottom rad/oil cooler bracket is hard to remove and refit, plus it's very tight behind the radiator, especially on the left side. Initially the bike felt rough and down on power, so I have a Rapidbike Evo on its way... But the more I ride it the better the standard fuel system seems to be adapting. It's as smooth as ever, but I still think I'm down a few BHP. The Racefit is VERY loud, so I'm running a cut baffle. Hopefully it won't affect the top end too much. I haven't been revving it out as I was riding without the bracket that attaches to the rearset. Now it's firmly attached I can give it some more revs and hopefully the fuelling will adapt some more. Or I'll just fit the Rapidbike unit. Here's a pic. The standard R cables fit without bending anything. My bracket isn't great, but if I spend some more on some nice fasteners it'll spruce it up a bit. Update for you interested in mapping/tuning. I just had my bike mapped, results are below. Before you ask, I haven't ridden the bike yet, it's still at the shop, but I have the result. 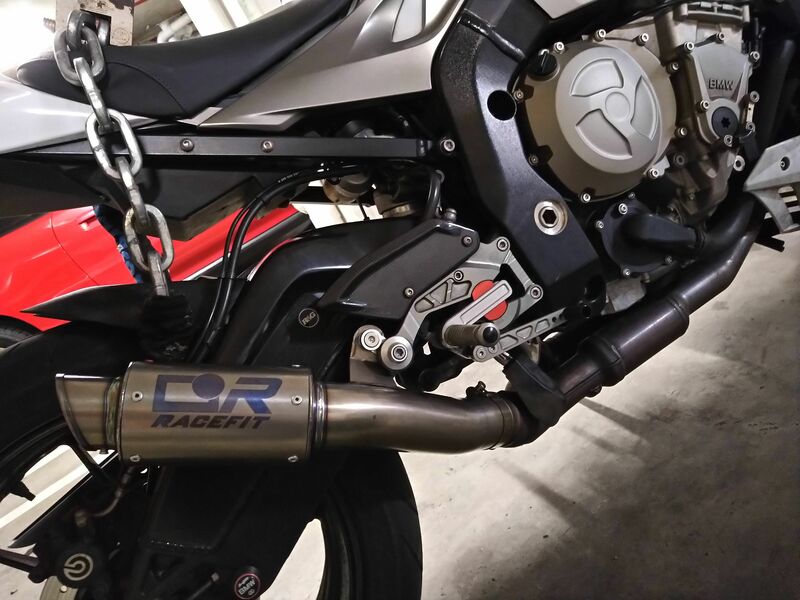 I put the S1000RR headers on my -14 S1KR, fitted a Cobra slip-on and what happened? Bike was loud, not a noticeable difference in power, felt the bike was running lean and still jerky at low speed i.e inner city riding. I did not put the bike on a Dyno with the stock exhaust, what real gain I have is therefore difficult to say, also, you can't really compare Dyno runs from different Dyno's, they will never show the same, you need to use the same Dyno, preferably within a short period of time. The Dyno I used was brand new and calibrated and should show real Wheel HP, the manufacturer said that what he had there was know as a "Heartbreaker", A Dyno showing real/low numbers. My first run gave me 143hp at the rear wheel using 12% loss that is bang on 160crank hp, according to the tuner this would be slightly above what would be expected from a stock bike (138-140Whp stock). There may be a small gain just from the more open -RR headers. My sparkplugs where white and the slip on shiny tips where clean, no sot on them at all, bike was running lean for sure. Installed a Bazzaz tuning box and they had it tuned. End result was 151Whp, using 12% loss places that at 169 Crank hp. At the end of the day the figures don't really matter, it's the before and after difference. looking at the charts, I have gained 8Whp from the tune, there is a considerable power and torque gain from 7000rpm and up. There is also sot building up on my exhaust tips now, not running lean anymore. 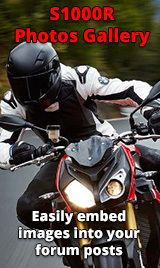 According to the Tuner, the bike is now smooth through the whole range, the midrange is significantly stronger, to the point there the front wheel is really hard to keep on the ground. Can't wait to take it out on the road, need a bit warmer weather and the salt to be washed of the roads first. Hope this answers some of you guys questions. Couldnt agree more, nice result and its nice to know its running at its optimum. concidered to buy a mid-pipe without the cat because I was hoping to get the low-rev grunt back, but my mechanic did not recomend it, because he was sure that I only would gain Max 5hp at the top of the register and no gain in the bottom register.